You’ve decided you’d like to sell your console on Resurface, the Audio Console Marketplace. Excellent choice. We know what sells and why. We know that buyers are looking at Resurface listings. From around the world, around the clock. If there’s someone looking at Resurface right now who doesn’t work with audio – most likely for a living or as a business – frankly we’ve no idea why. It’s really not for them. Before you’re able to prepare and submit a listing, you’ll need to Register on Resurface. If you already have, then you’ll just need to log in. Pricing for listings will then be laid out on the SELL page, along with the simple template form to create your own listing. Compare pricing – most Resurface listings have pricing (price on application is optional, but the most successful listings feature a price). If you’re logged in you can browse the pricing in the seller’s chosen currency. If that’s different to your currency, Hit CONVERT PRICE to get an approximate (non binding) currency conversion. TIP : Check items currently for sale, as well as items that are marked as •• SOLD •• Desks which have already sold remain listed – not just to make buyers feel bad for missing out; they’re part of what Resurface offers: the most useful pricing guidance available for used consoles anywhere. Think about what you want to tell a buyer. Spec and condition are vital of course, but the best sellers tell the whole story. What about the console’s history (provenance)? Perhaps tell the buyer what you liked best about using the console? Newspaper classifieds used to charge by the word. We don’t. Go for it! Possibly the most important piece of advice. At the top and bottom of every listing we’ve provided Social Links, which pull the page URL and main image ready to post with a single click on social media. Truth is, it’s likely you already know somebody, who knows somebody, who will buy your console. TIP : Audio people follow each other on social media. We’re what hipsters and internet marketeers call a Tribe, so be sure to use our share buttons to spread word about your listing. If we happen to see it – or better still we’re tagged – we’ll retweet it, share it & like it too. First, add your Listing Title and Summary. These are the headlines – these text fields are what will show up on the main BROWSE CONSOLES FOR SALE pages. This text, along with your chosen ‘Logo’ image, will be visible to every Resurface visitor. Pricing, location and contact details don’t belong in the text of these headline fields. 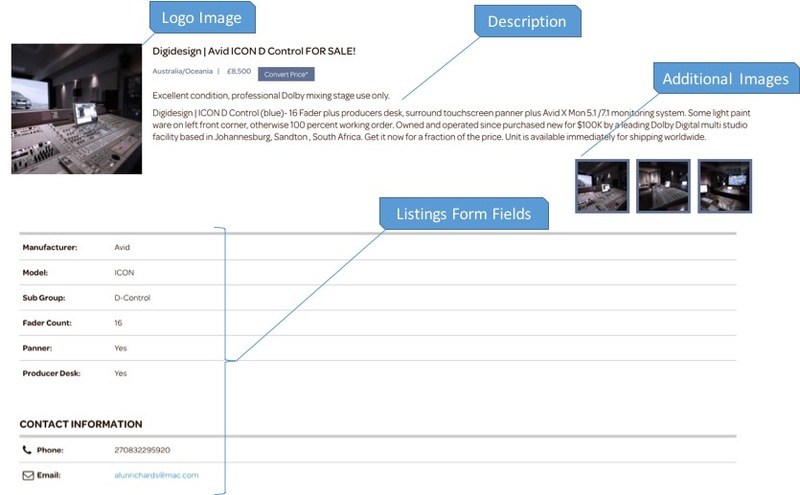 In order for a visitor to see your price and location (as shown above), along with the console’s full description text and your contact details (or to use the contact seller panel), they will need to be logged in. Next, simply complete the corresponding fields and category drop-down lists in the template and upload your images (choosing which one you’d like to set as your main ‘Logo’ image). When a logged-in user clicks your listing, they can see the information you provided in these template fields. Want to change the price, add more pictures, or update with names of a few more projects your desk has been used on? You can refresh and change your listing on-the-fly at any time, all under My Account. TIP : Your account dashboard will also let you see how many views your listing has had. Listings can be updated as many times as you wish. Interested buyers can get in touch using the contact details you provide on the listings form. This is probably a good time to double-check they’re correct! In many ways, selling a great desk at the right price to an eager buyer is the easy part. International shipping, on-site installation and user training can become sticking points in a sweet deal. Our SERVICES page provides details of specialist companies and individuals in each of these areas who have all done this many, many times before. Take away the headaches and help the deal along.